NCWL not only relies on our Volunteers but also the generous donations we receive from others in the community. We are always looking for donations. Donations may include; beds, blankets, towels, cat food (hard/soft), treats, carriers, dog crates, toys, litter boxes, cat litter, he liquid laundry detergent, bleach, liquid hand soap, hand sanitizer, plastic bags, liquid dish soap, bowls, pet dishes, saucers, paper towels, surgical gloves, disinfecting wipes, long folding tables, fans of any size, cat trees, condos, scratching posts, gift cards for Gas stations, Dollarama, Walmart, Canadian Tire money and straw for strays. If you or anyone you know has any unwanted items that you think we may be able to sell at one of our future garage sales and you wish to donate it, please Contact Us to arrange for it to be picked up or dropped off. ​ANY and ALL donations are appreciated!! NEVEAH'S CHA﻿RITY OF WEST LINCOLN looks after sick and injured cats every day. We often have a lot of baby kittens with no mother to look after them. The cost of formula, food and medical expenses is quite high, especially with the kittens. 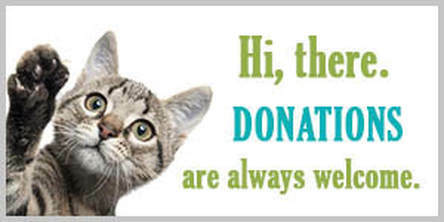 We primarily rely on adoption fees and donations to fund our rescue. If you have thought about donating and have a few dollars to spare now would be the perfect time. A donation in memory of a family member or friend to our cat rescue is also a lovely expression of your sympathy. WE ARE PROUD TO ﻿SAY WE ARE A REGISTERED CHARITY. WE ARE NOW A REGISTERED CHARITY. OUR CHARITY NUMBER IS - 849599535RR0001.